Natural lemon verbena ice is prepared with an infusion Natural Lemon Verbena leaves brewed hot then cooled till frozen overnight in an ice mould. With it, an infusion is prepared at normal strength 1 scoop per 200ml with hot water for 5min, and then chilled overnight. The kawakawa syrup is boiled with fresh leaves and water and reduced by half, strained and dissolved with the Rapadura sugar. To serve, prepare the glass with a garnish of lemon slice and verbena ice. Add 30ml of the kawakawa syrup. 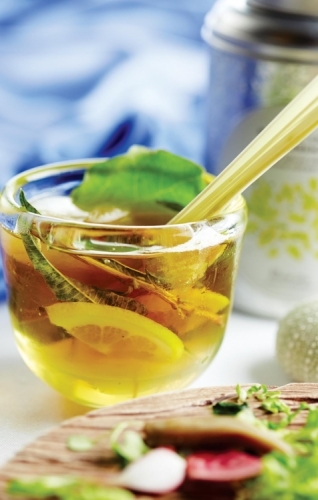 Fill the glass with the chilled lemon verbena infusion and garnish with lemon verbena flowers.